Falcon Lake for monster bass. Falcon Lake bass fishing Jackpot! 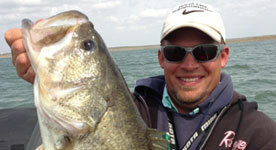 with fishing reports, hot lures, lake hazards, tutorials, and more! Check back often to get the latest. Get daily bass fishing reports and other Falcon Lake information from Jay by reading the Falcon Report. 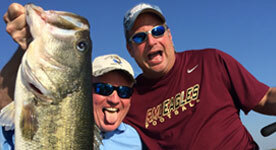 Want to fish the #1 bass lake in the country? Put the odds in your favor and hit the water with a guide who does one thing and one thing only, and that’s fish Falcon Lake for monster bass. High Stakes Bassin is a client centered guiding service that focuses on putting the client in the best possible situation to be successful. Read real reviews from satisfied clients.